GRPHP – When did you first get involved in the Nuclear Freeze Campaign? and what motivated you to get involved? Margi – Let’s see, Chuck and I got married in 1984, and I met my Best Woman, Kathy Connolly through IGE and the campaign, I believe, so I must have started doing that in 1981. It felt like an important thing to do, to do whatever I, personally, could to begin to rid the world of weapons that could cause the total destruction of the world many times over, and to let leaders know that we the people didn’t want to solve our problems that way. GRPHP – What kinds of activities were you involved in and what kind of training was there to assist to in the work that you were doing? Margi – My recollection is that IGE and a group of students, mostly from Grand Valley, was at the heart of this and divestment in South Africa, and raising awareness of things that were going on in El Salvador and Nicaragua, as well. I remember a few protests, one in Lansing that I may have a photo of, but no formal training. 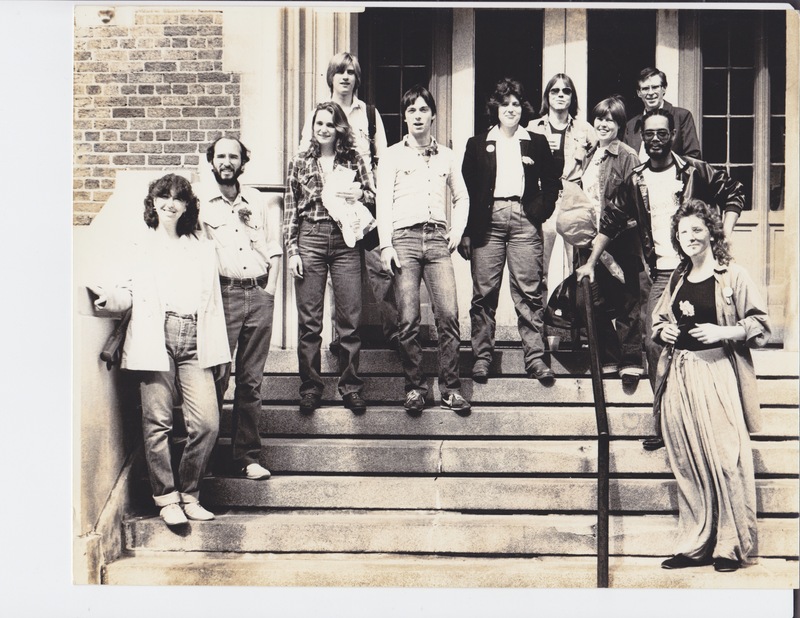 I worked on Equity, the IGE newsletter, with Chuck VanderWoude and others. IGE was the main guiding body, in the beginning. Then some local doctors decided to organize a local chapter of Physicians for Social Responsibility (PSR), and they hired me (a paid gig!) to be in charge of Ground Zero Week. This was kind of a coup for me, as I had no formal community organizing experience, and many around me did. I don’t quite remember how I ended up with the job, but I do remember Chet Maternowski being one of the physicians who started PSR, and I remember having an office in the old Medical Arts Building. GRPHP – Was there a central organization working on this campaign or was it a network of groups? If it was the latter, can you name the groups involved? Margi – The larger PSR organization had designated dates and various types of activities for raising awareness of the realities of nuclear arms build-up. I gathered statistics about our community, learned to write press releases and organize press conferences, and how to draw people’s attention to activities designed to disseminate information. I think there was a big culminating event, but I’m afraid the various demonstrations and rallies of the time get a little mixed in my head. Besides IGE and PSR, there were a number of church organizations involved. It was through these activities that I first met Doug VanDoren, then and still Pastor of Plymouth UCC. From what I could tell, as someone who had not been extremely socially involved prior to this point, this was the first grass roots organizing across the country, and it involves a lot of small groups. GRPHP – What sorts of tactics were you using to inform/engage people about the nuclear freeze campaign? Margi – I was able to use a lot of what I knew from years of theatre involvement, especially make-up. When a group of us went to a rally in Lansing, we were appropriately decorated with face make-up. And I remember one activity in particular (although it was an El Salvador protest, not nuclear) where I learned how to make someone look as though his throat had been slit. GRPHP – Did you build any lasting friendships based on your organizing work? Margi – One person I met back then, who was very active in all of this and with whom I am still close, is Sue Hartman. Our paths have continued similarly, so we still see each other and do things together. GRPHP – How did your involvement in the nuclear freeze movement impact your life after that campaign was over? Margi – I realized, after many months of working hard on these activities, that the most important thing I could do to change the world was to change myself, and not be afraid to speak out about injustice. The experience of being part of a grass-roots movement gave me hope that “little people” without a lot of money could really accomplish something. That’s why I was excited when MoveOn got organized and jumped on board. But the spinoff organizations and inundation of emails asking for money soon (after a couple of years) caused me to lose interest. I have always said, I would far rather be given something to DO than give money or sit through a meeting talking about it. GRPHP – Why is it important for people to know about this local history? 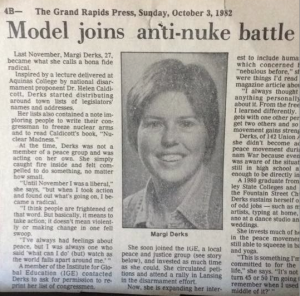 Margi – Looking back 30 years, I can see this activism in Grand Rapids as the seed of many positive changes that have happened since. 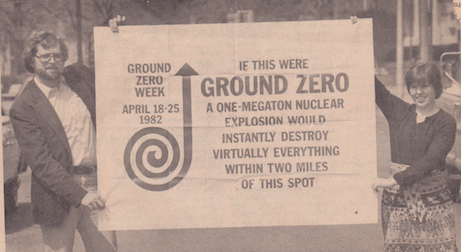 This entry was posted in Anti-Nuclear Movement and tagged anti-nuclear movement in grand rapids, Ground Zero Week, IGE, Margi Derks Peterson, Physicians for Social Responsibility. Bookmark the permalink.